Always Where I Need to Be! As the temperature drops and the nights get dark there is nothing like a meander through the Lanes with Lucy, my girlfriend. My reward following a window shopping stroll is a three course meal with a glass of wine. An autumn’s evening couldn’t be better. We are greeted at the door of Kooks by our waitress and shown to our table at the back of the restaurant. This offers a great view through the wood panelled restaurant, all the way to the well lit bar at the front of the building. 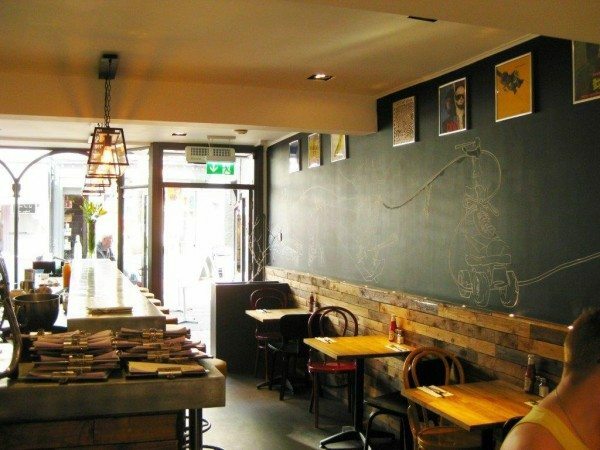 The decor is modern and smart with their favourite vinyl covers presented on the walls. A great playlist of music accompanies our dining experience, collated by the owner, and DJ, Tim Healey. After a long day at work, we both opt for a glass of Sauvignon Blanc to sip whilst deciding on the menu. The wine is fresh, fruity and crisp and would be wonderful with a cheeseboard on a summer’s day. The dinner menu handed to us on clipboards is a quirky touch, not over complicated with a great selection of dishes all just crying out to be eaten. Lucy decides on the Thai style fish bites, accompanied by the lime and coriander dipping sauce as her starter. The fish bites have a crisp coating with the traditional flavours that brought back memories of my travels through Thailand; the dipping sauce adds a refreshing touch to a wonderful starter. Though the menu has some fantastic options such as the smoked salmon and beetroot salad, the decision is a no-brainer for me. If you will serve twice cooked pork with fennel and cumin, I am never going to order anything else. 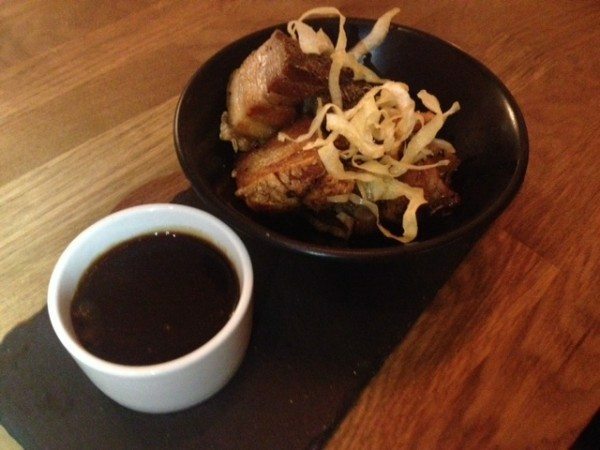 I am not disappointed; the crispy pork bites are a taste sensation, with apple and cider sauce cutting through the melt in the mouth fat of the pork. If I left the restaurant now I would be a very happy man, in fact I will definitely be sneaking in for a mid- week treat of just these (when Lucy is not looking). For each course the friendly staff make sure we are happy and enjoying the meal. As they clean away our starter plates I am getting excited at the thought of the iconic Kooks burger; I have heard great things and yet to have the pleasure of trying their burger. In a city that has become famous for the choice of burgers, Kooks restaurant has bravely entered the competition. 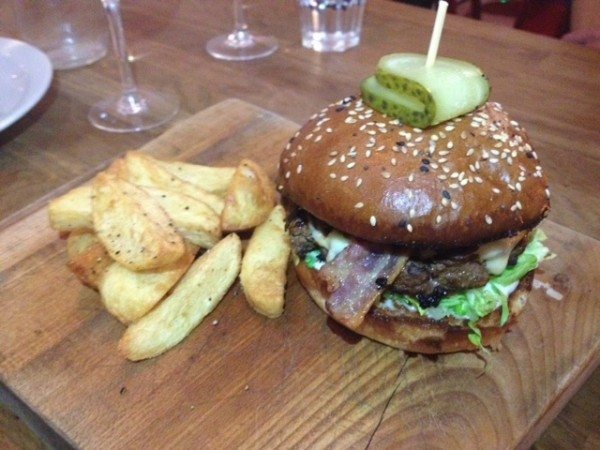 My burger with twice cooked chips is served on a wooden board, adding to the rustic feel. The brioche bun is golden and inviting, the smell of the candy bacon teasing me, adding sweetness to a well cooked medium rare patty. I love my meat rare but in a burger this can make it sloppy and the bun fall apart, Kooks however have found the perfect combination to make an easy eat, packed full of meaty flavours. I believe that they have entered the Brighton burger race and will be a strong contender for years to come! Lucy on the other hand has ordered the vegetarian option of spinach, ricotta and vegetarian parmesan gnocci with roasted goats cheese, griddled courgettes, peppers and wild rocket. Offering a contrasting presentation to my burger, the gnocci would fit perfectly in to a fine dining establishment. Vibrant green colours add to the feeling of a healthy mid week treat. 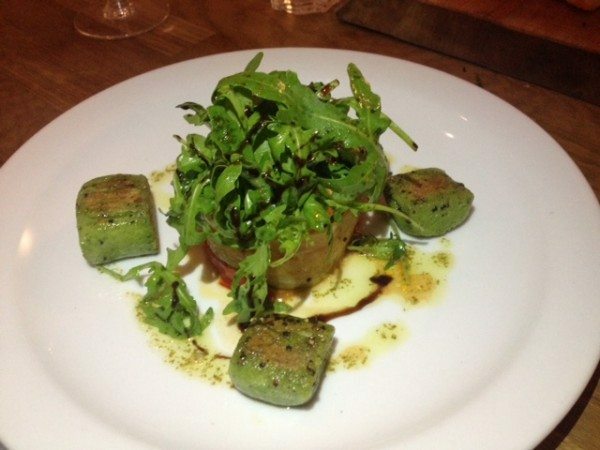 The roasted vegetable tower topped with goat’s cheese surrounded by the green gnocci delivers a Mediterranean punch. This tasty combination of flavours makes for a warming evening meal with lovely peppery undertones of the rocket garnish. Feeling full, but wanting dessert, we ask to see the menu. 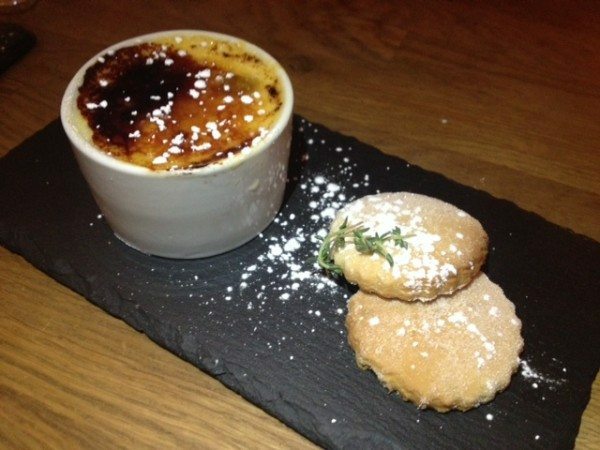 Recently I have loved the taste of rhubarb and decide straight away on the rhubarb crème brulee served with thyme shortbreads. The crack of the sugar as I break the top of the brulee is perfect, not too thick and charred perfectly. Delightful bites of rhubarb in the bottom add a tart and sour taste. The real surprise however is the thyme shortbreads. My taste buds are expecting the mellow after taste of the thyme but it is quite the opposite. The thyme is vibrant and the first flavour to hit followed by the buttery, melt-in-your-mouth shortbread. This is certainly an exciting flavour that I will introduce to my own baking; one of the best desserts I have had in a long time. 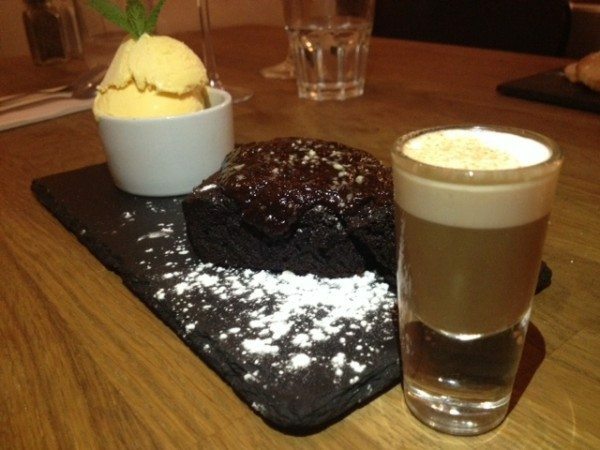 Being a chocolate lover, Lucy orders the chocolate brownie, rich dark and oozing with chocolate. It tastes great and the ice cream counteracts the richness nicely, but overall a little too rich for me; a mouthful is all I need. The accompaniment of a toblerone shot is plain delicious and on its own could be a great end to enjoyable meal. We leave the restaurant full and satisfied, with a nice walk to work off the food. 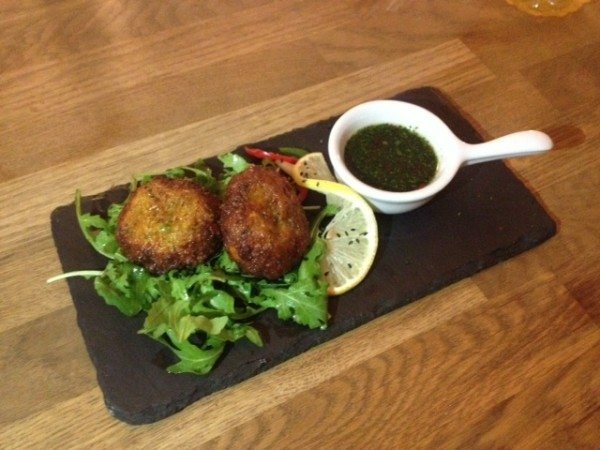 If you are looking for a midweek meal Kooks is perfect; nestled in the vibrant North Lanes they offer a great selection of food at affordable prices. I shall be returning and I suggest that you give Kooks a try, even just for the pork bites starter!